In this Blog you will be introduced to a level of healing that is practiced by very few practitioners around the world. I encourage you to take a moment and read this carefully because this information can save your life. Detoxification is the the process of clearing acidosis, toxins, wastes, mucus and harmful parasites from your body. The vast majority of these impurities come from our dietary habits and lifestyle choices therefore it is essential to drastically reduce or remove the intake of foods that are acidic and cause mucus and congestion in the body. When you detoxify your body you will gradually notice your symptoms diminishing and experience an increase in energy and mental clarity. At some point during the detoxification process most people go through some form of a "healing crisis", which is nothing more than the body purging and cleaning itself. When this happens it's important that you rest and allow your bodies self healing mechanism to do the work. Your body is an extremely intelligent organism and it knows exactly what it's doing. When you cut yourself your body will use its self healing mechanism and close the wound. If you break a bone your body will unify it. When it comes to the various physiological health conditions that people suffer from today we must recognize that the vast majority of these issues are self created through our dietary habits and lifestyle choices. This also includes many of the psychological health problems such as anxiety, depression, burn-out etc. which are often times linked to exhausted endocrine gland function. When we continue to consume foods that are enzyme deficient, fiberless, processed and acidic then our body will not be able to heal properly. Our body chemistry needs to be slightly alkaline and oxygen rich in order for our cells to preform at an optimal level. When our body becomes too acidic, our blood will coagulate and the lymphatic system will become congested. When this happens our organs and glands will start failing in their ability to function properly. This then leads to blood pressure problems, pain, stiffness in joints, tumors, neurological failure and many other well known health conditions. So if you wish to detoxify successfully it is imperative to remove or drastically reduce acidic foods from your dietary regimen and replace these with fresh raw plant produce. Deep tissue Detoxification involves a fruitarian diet consisting of raw fruits, vegetables and leafy green herbs. These foods are filled with enzymes, vitamins, minerals and water. They purify, strengthen, alkalize and hydrate the body and leave behind very little metabolic waste. There are various levels to detoxification as exemplified on the chart below. 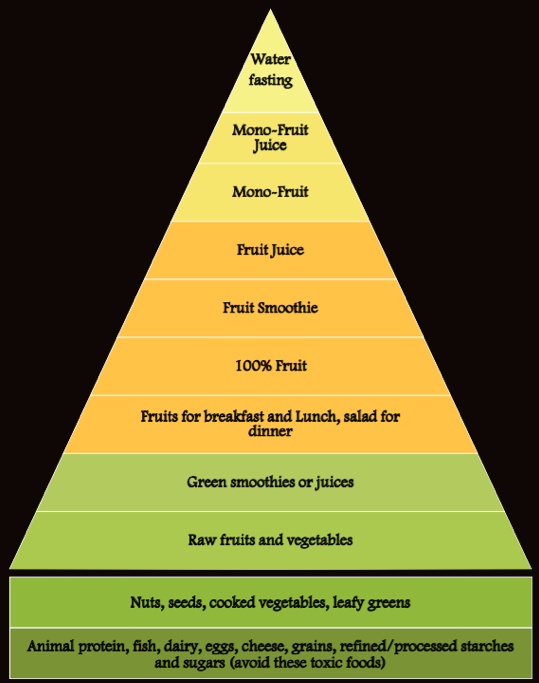 Move up or down the pyramid to accelerate or slow down the detoxification process. This is not a "quick fix" method of getting healthy. This is a lifestyle change that requires will power and discipline. Unfortunately some people are so addicted and engrossed into their eating habits that they have difficulty changing their ways, but it’s important to remember that you can also approach detoxification in baby steps and with more ease. Many people who are more advanced in their sickness are often times so fed up with their poor state of health that they roll up their sleeves and dive right into the deep-end. The degree and time it takes to eliminate your health condition depends on the amount of toxic build up in your body, your genetic blueprint and how determined you are to get well. I was introduced to this healing method in 2010 by my teacher and mentor Dr. Robert Morse N.D. who is a naturopathic docotor, bio-chemist and master herbalist based in Port Charlotte, Florida. Other health pioneers that had a very similar level of understanding of this knowledge were Dr. Norman Walker, Professor Arnold Ehret, Dr. Herbert M. Shelton and Dr. Bernard Jensen. After my certification course as a detoxification specialist with Dr. Robert Morse N.D. in 2012 I started working with people and helping them through their healing journey. It is extremely rewarding watching others transform from a state of chronic sickness to a state of wellness. I use to suffer immensely and used this healing modality to heal myself from anxiety, depression, chronic fatigue, inflammation, drug and alcohol addiction, jaundice and high blood pressure. This gives me a strong desire to reach out and help others. If you want to free yourself from your health problems then I encourage you to contact me for help. This level of detoxification is a very powerful healing method that has aided tens of thousands of people worldwide in reclaiming their physical, mental, emotional and spiritual health. Detoxification is the golden key that will open the door to the kingdom of vitality!